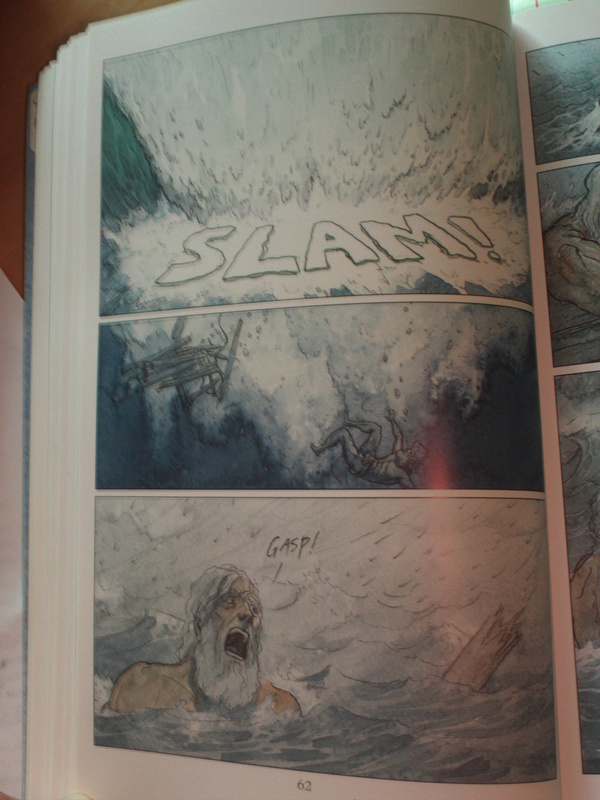 Gareth Hinds’ adaptation of The Odyssey into graphic novel form is a stunning achievement. I grew up on these stories (seriously, I love a good bit of derring-do) and I admire his work here. Adapting The Odyssey can’t be easy. He does well in selecting ‘highlights’ and creating a continuous narrative that drives itself steadily throughout the book. The only areas where it faltered a little for me were at the start as we had a lot of exposition to get through. However, if you persevere through these opening chapters, you’re rewarded with a richly coloured tapestry of stories. I love the colour palette that Hind’s chosen to work with; warm, sun-bleached colours of blues and greens and yellows. It’s intensely Mediterranean and also very classical. I think if this book struggles anywhere it’s in the use of lettering . Speech and captions throughout tend to default to a sort of left-justified Times New Roman esque font. You can see an example of it in the image below. What’s particularly galling is that this page also possesses one of the most stunning panels in the entire book. The speech bubble where the Bard recounts the fall of Troy is superb. Utterly utterly superb. This use of lettering remains steady regardless of the shape of the speech bubbles or the interaction throughout the scene. So we regularly see lovely, fluid, interlocking speech bubbles in a conversation (as above) but then they’re filled with this kind of rigorously standardized font which can’t help but feel disjointed. Lettering everything in this manner also doesn’t help to distinguish characters or captions – it borders on being typographical white noise. It’s a shame as well because there are points where the lettering (sound effects etc) is superbly done and shows what this book is capable of. It’s a shame that the lettering doesn’t match the quality of the artwork. Some of Hinds’ strongest panels are wordless and some moved me to tears. The visual storytelling on display here is, at points, outstanding. The below image for example silently tells us that these characters are connected, despite distance and divide, they remain irrevocably connected. It’s brilliant. Hinds’ Odyssey is ultimately a book of contradictory brilliance. It’s so beautiful but you may have to wade past a lot of stuff to get there. The artwork does look extraordinary in the photos you show, too bad about the text part, but I am very curious to see this in person. I am developing a real appreciation for graphic novels, though I am afraid they may replace reading the original. It’s very much worth seeing it in person which is why I added the pictures – I didn’t think a text based review would do it justice. Gorgeous artwork, but I can see what you mean about the text. How very disappointing. It grates, even more than some kind of attempt at Greek script would. If only it had some sort of vague connection with the speech bubbles and the artwork but it just doesn’t – it’s so disconnected. It’s such a shame because if the text were on par, this would be one of the strongest graphic novels I’ve ever read. Pingback: Beowulf : Gareth Hinds « Did you ever stop to think & forget to start again? 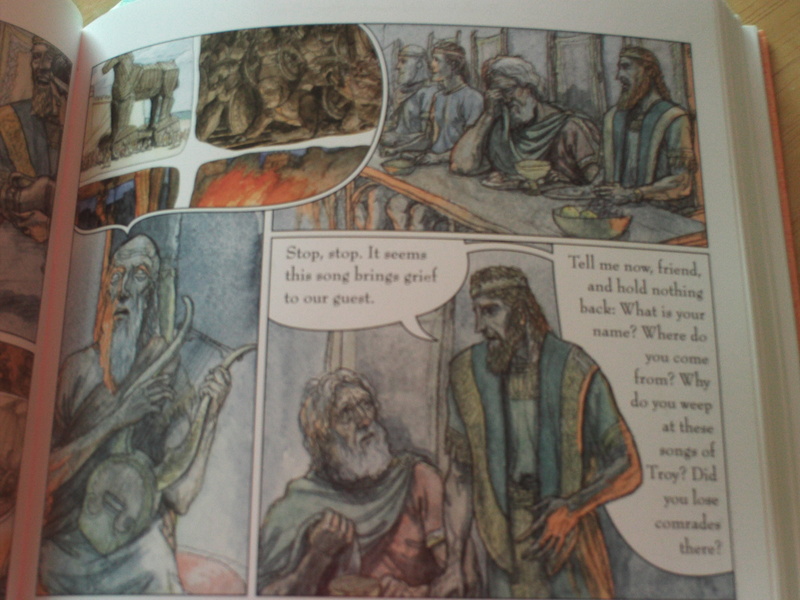 This graphic novel has stunningly beautiful artwork and the colors convey the tone of the text. I used it with my ninth graders this year and they loved it. Although it follows the plot well, it lacks the beauty and depth of the poetic text. It gives details about text but it does not recognize nuances that appear in the poetry of Homer. This coming year we are pairing it with The Odyssey text to get a fuller experience.